The irresistible supersoft fleece Pug, BT, and Frenchie Bodysuit is designed to set a new protection standard for your dog! 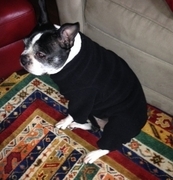 Its form fitting shape covers Pugs, Boston Terriers, French Bulldogs and Staffordshire Terriers from head to toe, with a turtleneck, four leggings, total belly coverage and a harness opening. The Pug, Boston Terrier and French Bulldog Bodysuit comes in 3 sizes, enabling it to fit both the smallest and largest of their breeds! By stretching to the width, it will fit Pugs, Boston Terriers, French Bulldogs and Staffordshire Terriers of different girths and is cut to allow your dog to perform all activities without interference. Made to last from the best velour fleece, it is perfect for cold weather. Bodysuits have no flaps, stretch for easy on/off, resist rain, and are fast drying wash and wear. They are the ultimate in fashion and function! The Pug Clothing Line also fits Boston Terriers, French Bulldogs, Staffordshire Terriers and similarly shaped breeds. Small - Length 13-15", Girth 20-22"
Medium - Length 14-16", Girth 22-24"
Large - Length 16-17", Girth 25-27"
For the best sizing, please write your dog's length and girth measurements in the comments section of your order.